You know that moment - the great bluff, the one-outer on the river, the massive pot that changed the game... BOOM! Well now you can share it on video with the BOOM! hand replayer. With just the click of a button, you can instantly upload your unforgettable hands in video form. There are two quick and easy ways to BOOM! 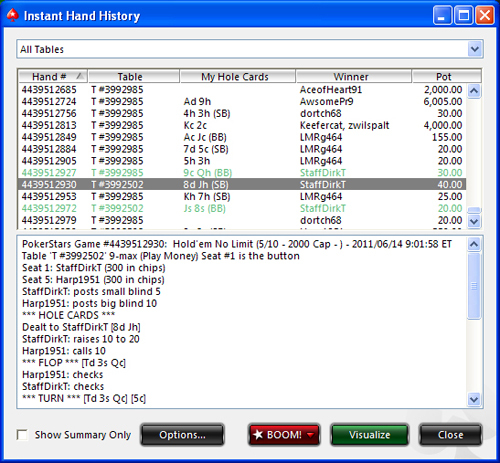 a hand from PokerStars tables. 1. Click on the star in the table chat box. 2. Open the instant hand history (the quickest way to do this is click the hand ID # in the top left corner), highlight your chosen hand and hit the BOOM! button. Once you've hit either of the BOOM! buttons, choose which site you want to BOOM! the hand to. By default, all BOOM! hands are jointly uploaded to BoomPlayer.com. BOOM! will be used to host all the most important hands played on PokerStars, including the biggest pots from events like the Spring Championship of Online Poker (SCOOP), the Sunday Million and the Road to 100 Billion milestones. Also watch out for hands from members of Team PokerStars Pro. You’ll get to see how the pros play their big hands, and they may even share some of their thoughts on the hand in the discussion section. Try out this exciting new feature and let your friends check out your play, and visit BoomPlayer.com to watch incredible BOOM! poker hand videos. If you have any questions about the BOOM! hand replayer, contact support@pokerstars.uk.